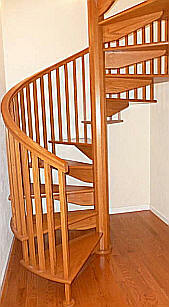 Not only will a Stairways, Inc. all wood spiral stair be a piece of furniture that you can walk on, they are practical. As shown in this photograph, 64" diameter with 4" baluster spacing, this beautiful spiral stair is code compliant. Stairways, Inc.'s all wood spiral stairs are completely assembled in our plant, disassembled and packaged to ship. All components are numbered for field assembly, and can be installed by two people in less than a day. Stairways, Inc.'s wooden spiral stairs and wood components arrive sanded; sealing, staining and a top coat are field applied. Any questions concerning all wood spiral stairs or any Stairways, Inc. products, contact our sales staff.